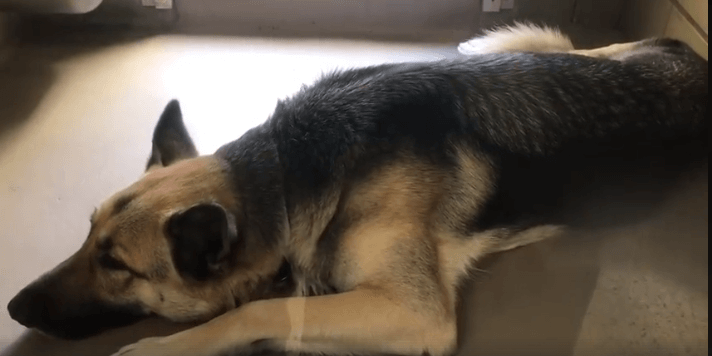 A young German shepherd, not even two years of age, is being held at a busy California animal control agency. The dog, known only by her ID number (A1492373) was taken in at the Riverside County Animal Control – Riverside Shelter on December 17 as a stray…though in all likelihood she had an owner, that person never showed up to reclaim her. Shepherds are known for their loyalty and intelligence – these same traits have left this young dog heartbroken and confused. It is apparent that this girl is missing her family and wondering what she has done wrong. This unclaimed “stray” is in need of help from strangers. Please take a moment to network her adoption information and help her find a new home where she will be loved and kept safe for the rest of her life. STATUS YELLOW #A1492373 (URGENT! SHE WAS DUE OUT 12/21)I am a female, black and brown German Shepherd Dog.The shelter staff think I am about 1 year and 7 months old.I have been at the shelter since Dec 17, 2018.http://petharbor.com/pet.asp?uaid=RVSD.A1492373Please read 👇🏻👇🏻👇🏻👇🏻Saving Riverside Shelter Dogs is in no way affiliated with Riverside Shelter. We are not shelter volunteers or shelter staff. We simply just want to help save the dogs by videoing them and networking them for reputable rescues and responsible adopters. ▪️This page does not facilitate adoptions, rescues, transportation, pledge tallying or collecting under any circumstances, UNLESS it’s a reputable rescue we know and trust. ▪️This page does not always have current status of an animal after it is removed from Petharbor. Please do not post “Update? ?” on the threads. If you would like an immediate update, please call the shelter. If and when we receive an update, we will make sure to post it. ▪️If you pledge on a dog that is pulled by a reputable rescue, please intended on honoring it. Repeatedly pledging and not honoring will also get you banned. If you are pledging on a dog, and receive a pledge collection from a rescue you are unfamiliar with, or feel uneasy about, please research them before honoring. ▪️Bad mouthing the shelter will get you banned. We strive to work with the shelter, not against them. The animals need us more than we need drama. ▪️Our videos MAY NOT PORTRAY a dogs true behavior. Please do not intend to adopt based on the behavior of the dog in the video! Please go and meet the dog in person. ▪️The shelter does not conduct out of state adoptions over the phone. If you are into nterested in adopting an animal, you MUST physically visit the shelter and fill out proper paperwork. ▪️Dogs who are scheduled for euthanasia will USUALLY have a Petharbor link that states “I am no longer available” in red writing. Their photo will still be visible. These dogs are still alive and need IMMEDIATE rescue but may be euthanized at anytime. When a dog’s Petharbor link says “Sorry this dog is no longer in our online database. Please check with the shelter to find out it’s availability” and their photo is NO LONGER visible, it means the dog has been adopted, rescued or euthanized. ▪️For a break down of what the different color status’s (green, yellow and red) mean, please read our pinned post. Pinned post will also contain a link to view the current color coded dogs at the shelter. You can access pinned post here: https://www.facebook.com/804803646241030/posts/1764301973624521/Shelter address: 6851 Van Buren Boulevard Riverside, California 92509Phone: 951-358-7387M-F 11am-6pmSaturday 11am-5pmShelter does not answer phones on SaturdayRescue department: Rescue phone: 951-358-7302Rescue email: rescue@rivco.orgRescue desk is closed on the weekends. Rescue desk is closed on the weekends.